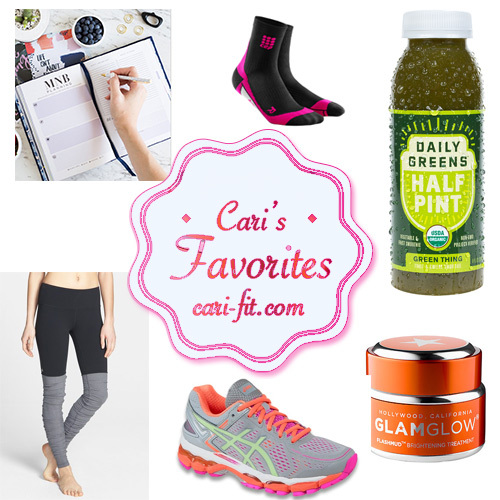 Fitness Favorites To Jumpstart The New Year + Sprouts Giveaway! Everyone is always excited to start on their fitness goals in January but by the time February rolls around, many people have already given up. One of the best ways to get motivated and stick with those new year’s resolutions is to try some new gear, new clothes and maybe a new grocery store. Below are some of my favorites that I thought I’d share to help keep you motivated. Plus, I’m doing a giveaway for a $25 Sprouts giftcard (see below for details)! New Workout Clothes. Since it’s still pretty cold out – I’m still wearing warm leggings. I also really like the legwarmer and layered look so I love these Alo leggings that I found! They also fit great and don’t get too hot for indoor workouts. New Socks. I like items that multitask – so I really like these new short CEP Compression Socks. I wear them under my leggings whenever my feet are tired or after a tough workout. I became a fan of the brand years ago when I started running marathons because the socks were great as a recovery tool for me – they reduce swelling and improve circulation. These are their new shorter version that focus more on the feet and ankles and are great after (or during) any workout. New Beauty Products. This really isn’t a “fitness” product – but I’m addicted to GlamGlow Mud. It’s a great facial exfoliator that’s also a mask and it has a bunch of organic ingredients that lighten dark spots and even out skin tone. I’ve tried other masks from this line and this one is by far my favorite. Get a Fitness Journal. If you haven’t checked Aussie brand Lorna Jane by now you are missing out! I love their workout clothes and the owner, Lorna has some great books about living a healthy lifestyle and also healthy recipes. 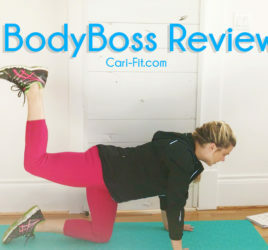 Their motto is “Move, Nourish, Believe” (MNB) and they make a great “MNB” diary. Also, journaling your fitness goals and keeping track of your diet and workouts is one of the best ways to stay motivated and on track. Try A New Post-Workout Treat. After your workout – you should really incorporate a serving of protein to help your muscles recover. Low-calorie protein shakes or bars are great for this. However, I sometimes like to recharge by having a green juice after my workout (especially after hot yoga) and Daily Greens makes some great ones. Lately I’ve been buying their mini “Daily Greens Half Pint” green juices at whole foods which are only 50 calories and provide your body with a lot of vitamins and antioxidants. My toddler also loves them! New Shoes. One of the best ways to get motivated to workout or go for a run is to have some fun new shoes! My favorites for running are still Asics but I also like Nike for cross training and gym workouts. Try A New Grocery Store. I like switching things up and go to about 5 different stores around town to get my groceries. Sometimes going to the same store gets boring and we tend to buy the same items over and over (including the unhealthy stuff). If you don’t live in an area with more than one store – just pack a large cooler and once a month or so venture out and try something new. Farmers markets are also great! My favorites are Sprouts, Whole Foods, HEB, Central Market and Trader Joe’s. *I’m giving away a $25 giftcard to Sprouts Farmers Market! 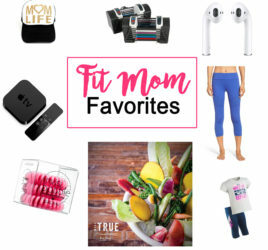 All you need to do is comment below and let me know what your latest favorite fitness product is and/or how you are keeping up with your fitness goals this year AND share this blog post either on Facebook, Twitter or Instagram (just share the photo) or click one of the links below via Shareaholic. The winner will be selected randomly and announced by Friday Feb 19th (check back here)! I always have my contigo water bottle with me wherever I go. They were cheap and have been the best ones I have found so far. I bought three so I can keep them filled and cold for when I want to grab and go. I also don’t know what I would do without my nespresso machine- an espresso shot (my fave is the Dulcao from Brazil) in the morning gets me moving and helps me knockout my early morning workouts and start my work day! Thanks Courtney! Those are good ones! I’ll have to check out that water bottle! (1) Arm sleeves, especially for running. They keep my arms warm, but I can also throw them off during a marathon when I get too hot. (2) Bands – I can keep these in my purse and workout anywhere!